Earlier in the year, I posted an image of this Bumastus niagarensis (originally described in 1879 as Illaenus niagarensis) when it was found (see Waldron Shale Trilobites). It has now been cleaned with sand abrasion and exposed more with an engraver. 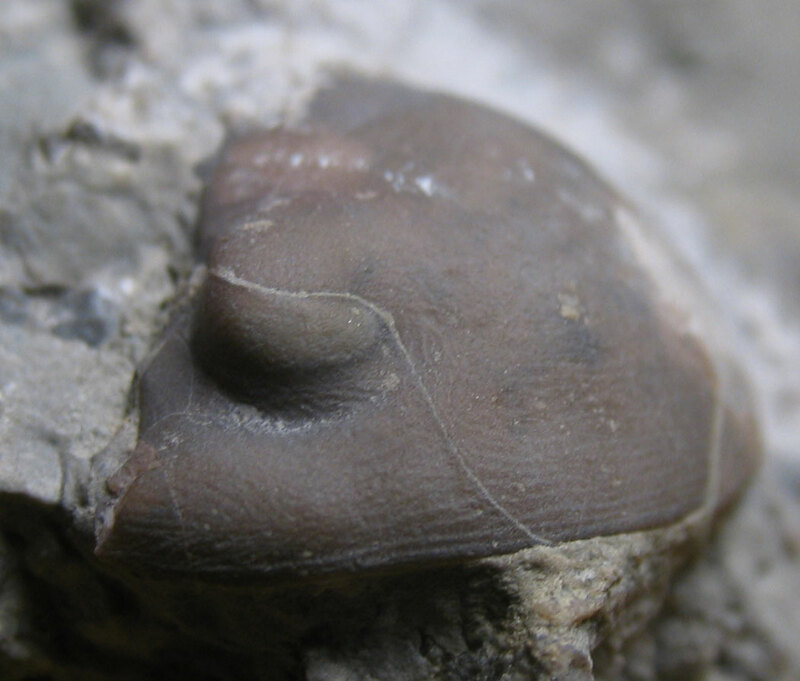 It was found in the Waldron Shale of Clark County, Indiana which means it existed in the Silurian Period. 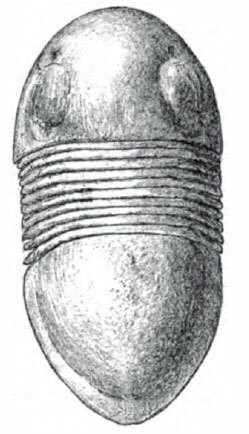 The cephalon of this Bumastus niagarensis is about 30 mm wide. Below is a visual comparison of the same fossil before and after cleaning (click on image to enlarge). This trilobite as some eerie looking eyes and interesting patterns on its outer plates. These types of fossils are fun to prep because of the rapid and noticeable progress when cleaning. Thanks to my cousin for letting me use the cleaning tools. 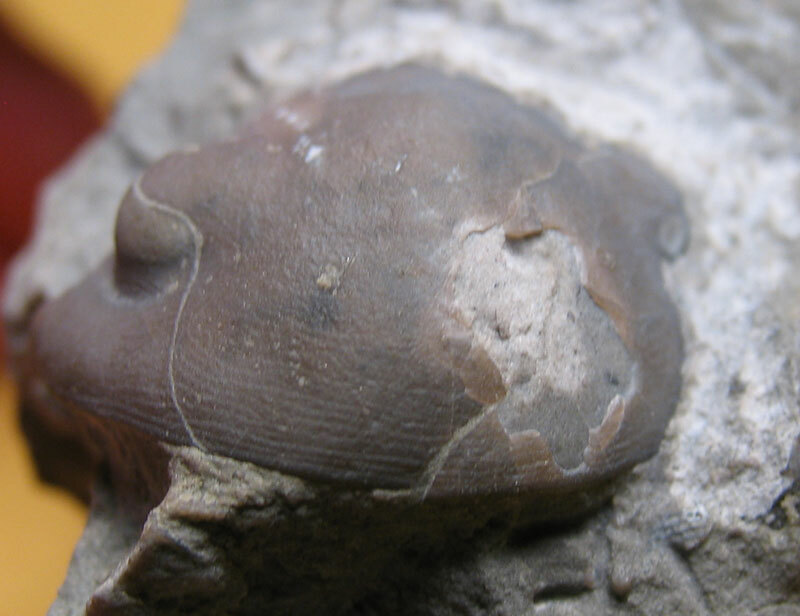 Fossil preparer Marc Behrendt has posting a very nice article on his website entitled: Trilobites of the Rochester Shale. When he describes the Bumastus ioxus of the family Styginidae, a comment is made that "the outer edge of the exoskeleton preserved the best, the central portions of the trilobite seemed to possess no or very thin exoskeltons." This next image shows the cephalon from the front and how its one side is still embedded in the matrix. The white area reveals activity of the engraver trying to remove matrix to reveal more of the other eye and rest of cephalon. The front is damaged and the shell is gone. The specific features of the Bumastus niagarensis noted by Whitfield were: "cephalon rather convex, with long dorsal furrows, no lip or concave border on the cephalon. Eyes of medium size, situated nearly their own length from the posterior margin, thorax short, pygidium long, rather pointed behind, with narrow concave border." 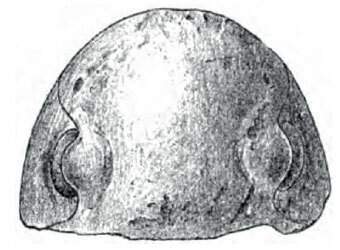 Image from Plate 1, Figure 10 - by E.N. Fischer, Del. As of the writing of this blog post, one can buy Bumastus trilobites from the Rochester Shale Formation of Middleport, New York at this web page on the Indiana9Fossils site. Their fossils are more intact than this one but were smaller trilobites. Also looking at the pictures the fossils appear to be coated with some sort of sealer. They also have a prepared Calymene breviceps trilobite found in the Waldron Shale of Indiana for sale. In addition, the Indiana State Museum has 55 Bumastus trilobites pieces listed in their collection database. They appear to be fragments collected from Blackford County, Indiana. If you are in the Indianapolis area visiting and like fossils, they have some great geology and paleontology displays.